This is a revised version of original ChessWar board game. Special thanks to Rami Laaksonen (the original playtester), J.C. Klice (most valuable help for the new version), and other playtesters and people at Alter Ego. Not for commercial use, all rights reserved by the author. When playing, I recommend to print a few extra copies of army lists for easy and helpful reference for the players. The old ChessWar is also available for comprasion. A small but sturdy dwarf army is confronted by a huge ratmen horde. 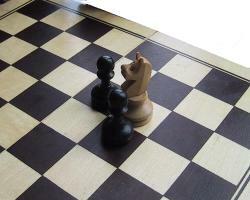 ChessWar is a strategic game for two players. It is meant to be played on a standard chessboard with standard chess pieces although it can also be used on any kind of battlefield made of squares. It is NOT chess with dice and some extra rules! 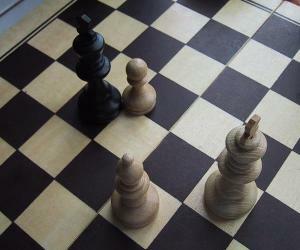 Instead, it is strategic game played with chess pieces. So, pieces are not automatically captured, some pieces (units) have ranged attacks and all your pieces (units) may move during your turn. Object in ChessWar is similar to standard chess: Defeat enemy king, called general or warlord etc. in ChessWar. The main difference is that in this game, all units of each army can move each time the player has his turn. Note: For simplicity all references to players are made with 'he'. Readers may substitute she instead of he in all places. All chess pieces are used to represent some kind of unit of your army. This unit type depends on the selected army, as in ChessWar, you can choose to play elf, dwarf or even scary undead army! King represents your king, warlord or general and his heartguards. Queen represents mighty wizard or similar magician of your army. Rooks represent your catapults, siege engines or giant troops. Rooks usually have long range support attacks. Bishop represents your archers or other similar ranged units. Knights represent your cavalry, was it 20 knightmen with war horses or two dozen wolf riders. Some armies do not have knights at all. Pawns represent your core army, is it 50 pikemen, beastmen or fearsome zombies and skeletons. Move is speed of the unit. Unit may move up to this number of squares each round in normal conditions. Movement can be done laterally or diagonally. Save represents the toughness and morale of the unit. In many situations, a save roll is called. The unit must then roll this number or greater with d6. Sometimes this roll is modified by some number, but in any case, roll 1 always fails. Note that if the modified save roll requires you to roll 7 or more, it simply cannot succeed. Melee is unit close-combat skill and is used to modify melee combat rolls. In addition to these basic attributes, some units have special abilities like bows or spells. These are explained later on. 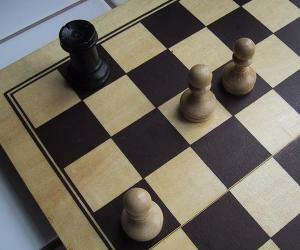 Following armies are currently available in ChessWar. Exact composition of each army is provided at the end of the rules. Chaos: the dreadful and evil army of Chaos Lords come from the Chaos Wastes far beyond any civilization. The army includes lots of potent close combat units but is usually few in numbers. Like the army, their foul chaos magic is aimed for destruction and attack, not defense. Dwarves: slow but tough, all dwarf units are heavily armored and powerful in close combat. Their real weakness is in speed as they have no cavalry and all units are very slow because of their small feet. Elfs: from the deep forest come the race of pointy-eared fellows. Unlike other armies their basic infantry are all armed with bows, filling the sky with long arrows. And when the enemy army closes, the excellent cavalry and mighty treemen can stop it in tracks. Humans: the armies of the human kingdoms and empires has perhaps the most versatile army, with possibility to yield lots of cavalry, bows, catapults or plain infantry, backed with wide variety of spells. Orcs: the green-skinned big and tough but a bit slow and stupid warriors of the barren lands are fierce opponent, coming in great numbers and taking lots of punishment. Along their army come regenerating, acid-womiting trolls and the fastest cavalry of the world, Wolf Riders. Ratmen: from underground caves and tunnels arrive a race of human-like big rats with long legs and many relatives. Rats come in vast hordes, but have no real artillery nor cavalry. However, even the basic infantry is far faster than melee infantry of the other armies, except for the long-legged elfs with their bows. Undead: Last but not least, the scary undead army led by an undying liche lord arrives from the lost cities and cemetaries. Only the bravest can stand the unnatural horrors of the living dead who walk the earth again. But if the opponent can overcome the fear of the dead, they find that normal zombies and other undead units are very weak and slow in combat. Both players must select which race they will use (Human, Elf, Dwarf..). Choice could be made secretly or openly, as players like and players may have army of same race as opponent's (but this is not recommended). It is also recommended that players reveal their choice before proceeding to next step. After player has chosen which army he will be using, player selects the composition of the army he is using. Each army always has one general and then pre-determined amount of points, which are used to pick various units for the army. Players are encouraged to use all points they have, any remaining ones are simply lost. Army composition is not revealed to other player until set-up is over. Practically phases 2 and 3 can be done at the same time. Both players deploy their army in first three rows in board on their half. Some kind of cardboard is recommended to 'split' the board so neither player can see where his opponent deploys. After the deploy is done, the cardboard is removed. The game is started by the army with smaller initiative number (order is: elf, human, dwarf, chaos, orcs, ratmen, undead). If both players have selected the same race, both players roll a d6 and higher one (reroll ties) decides which one goes first. The player not starting the game can then re-arrange his entire set-up any way he chooses, staying in first three rows, before the other player takes the first turn. Now, the game of ChessWar is ready to begin! The chaos lord has lost all its retainers and now makes the last desperate charge against human army. 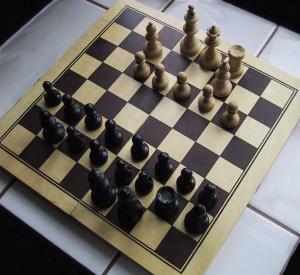 Gameplay in ChessWar is played in rounds. During each round, each player takes his turn, moving all his troops and attacking with them, in turn order described below. After each player has taken their turn, a new round starts. The game lasts until either general is dead. Each turn is divided into 3 separate parts that cannot be mixed. In movement phase all units able to move in player's army may be moved. In shooting phase all units armed with some kind of ranged attacks may fire them at enemy, and in melee phase all units in hand-to-hand combat can attack enemy troops in same melee combat. Order in each phase is not fixed nor simultaneous. Player may do his actions one at the time, for example choose target by result of previous shot done by his other unit. Spells can break the normal flow of the game, but otherwise player cannot react on the turn of the other player. Each turn, player is allowed to move every unit in his army which is not currently in melee. Each unit may move up to number of squares equal to its move characteristic and is allowed to make a special charge-move after that. If the unit has move of 0, it cannot move at all, but can charge enemy units which are next to it. Each move is to any adjacent square (including diagonally), but the unit cannot move from square adjacent to particular enemy to other square adjacent to that same enemy. However, the unit can first move away and then return to be next to the same enemy. An unit cannot move from one square next to enemy to any square next to same enemy. The same applies to enemy situated diagonally to unit. However, the unit can first move away and then return to different square next to same enemy. Charge can be a diagonal one only if squares on both sides are either empty or occupied by own units. Unit which is not brave can only charge scary unit if it first succeeds in save roll. If the save fails, the unit is stopped in its tracks and cannot move anymore this turn. See special attributes for further details. If the charge is successful, place the unit on edge of its square toward the enemy, and do likewise with the enemy. Both units are now in melee and neither can leave it until either side is destroyed. If the target is already in melee with other unit this does not stop another unit attacking it, just place the unit on the edge of square. Now target must destroy all its opponents before it is free to move. An unit can charge any enemies laterally, or even diagonally if side squares next to both units are empty. An unit cannot charge diagonally if either side square has an enemy unit. The unit can always charge laterally. Own units do not prevent the unit from charging diagonally. Some units are armed with some kind of ranged attack like bows, catapults or large boulders. They are allowed to fire at one enemy unit in this phase with their weapons unless they are in melee. Shooting is started by selecting the target unit to attack. Target for attack must be within range of weapons and visible by firer or other unit in their army if weapon can be fired indirectly. Visibility is determined from center of firer's square to center of target's square; any square that is crossed by this line blocks the visibility if any unit is in that square. If this line crosses exactly between two squares, firer is free to choose which one of these two squares is crossed. The black unit marked with A can clearly see white unit 1. It can also see unit 2 as the line of sight crosses two squares and the empty one can be selected. It cannot see unit 3 as other black unit blocks the line of sight. However, as another black unit sees unit 3, indirect fire can be used. White unit 4 is not seen by any black unit and cannot be targeted even indirectly. 1-2: one random opponent is hit! If any unit in the melee is destroyed, other combatants do not get a free follow-up move. If target is hit, it must make its save or it is destroyed. Note that the roll 6 does not always hit. Remember that if the target was in melee and was hit, you must roll if you hit your own unit! Catapults are heavy siege engines which have unlimited range and can be fired indirectly, althought the target square must be seen by at least one unit of the same army. However, catapults have minimum range of 2 squares, they cannot be aimed to square next to catapult itself! To fire a catapult, select a target square seen at least by one own unit, and then roll 2 (direct) or 3 (indirect) scatter rolls, checking the table on right. The direction is aligned according to the shooting player and the board, i.e. number 1 is one square toward the other end of the board. The order of the dice is not important, just handle all scatter rolls. So if you roll 2 and 5, the final result is one square right of target square. Or if you roll 1 and 3, it hits the original square. The scatter rolls can make the shot to fall short or even on the top of the catapult itself! However, if the shot falls in the catapult square, it is just a miss. If the shot ends out of the gaming board, it is a complete miss. Any unit in the target square is hit and must make its save or it is destroyed. If the target hit was in melee, you must roll if the catapults hits the other side of the melee as described above. Rocks and plaguebombs: these special catapults have maximum range of 2 but no minimum range and always scatter just once (except in storm), even when used indirectly. The unit can move before making the attack and it does not affect the accuracy. 6 or more* Defender is destroyed. 5 Defender must make 2 saves or it is destroyed. Brave defender must only save once. 4 Defender must make its save or it is destroyed. 1 or less Attacker destroyed unless save is made. * a natural roll 6 always causes this result regardless of any modifiers. However, if the defender is scary and the attacker is not brave, refer to result 5. The follow-up move is done after all other effects are handled, like Plague or Heal spell. Units with move of 0 can only make follow-up charge, not move. On a result 1 or less the defender cannot make the follow-up move, nor can follow-up move be made if the melee combatant is destroyed in the shooting phase or by other unit. The human catapult is surrounded by advancing dwarven warriors. Units can have various special attributes, marked in their statistics. When this units charges into melee during movement phase it gains +1 to its Melee value for this turn. Thus, if the unit normally has Melee -1 it has Melee +0 when it charges. If the unit itself is charged, the unit makes follow-up move or the melee continues, this bonus does not apply. The unit is armed with bows and can use them to shoot in the shooting phase. Refer to shooting rules. The to-hit number is given for each unit with bows. The unit is very brave (or just stupid) and ignores special attribute scary. In addition, brave units perform better in melee combat (result 5). The unit has catapults (or similar siege weapons) and can fire them in shooting phase as explained in main rules. Crossbows are like bows but are limited so that they cannot be fired indirectly nor cannot be fired if the unit moved in movement phase. As bows, but refer to elite elven archers with maximum range of 5 squares instead of normal 4 squares. Unit is infected with plague; if it is destroyed while in melee all units in melee with it may have caught the plague and must make their save at +1 or are destroyed. This unit is also immune to any kind of plague. The unit has poisoned bombs. These are used as catapults, but have maximum range of 2 squares, can be thrown to square next to attacker, and always rolls just one scatter die (even if used indirectly). Any unit in target square must make save at +1 unless is immune to plague. If target was in melee, it and all its opponents are hit! When the unit is destroyed, just topple it over. If any unit moves to its square, remove it from the game, but otherwise at the end of the turn, the unit regenerates on a d6 roll 3+ and is bought back to battle. If the roll fails, remove the unit from the game. This unit can never be raised as zombies, but it spreads plague normally. Any new hits to unit are ignored when it is lying on the ground. Giant boulders hurled by trolls or giants are counted as special catapult attack, with no minimum range but max range of 2 squares and 1 scatter always (even indirectly). The unit can cast spells. Refer to magic section. The unit moves via teleporting. Just move the unit up to its maximum move squares, ignoring any intervening units. The unit can move away from melee combat this way. Any charge move is done after the teleport move. These units have normal catapults except that they fire ammunition with shrieks and screams, causing supernatural terror. Target hit is automatically destroyed unless it is brave. Brave targets must make a normal save to survive. Most armies can include some kind of wizard in their force which is capable of launching devastating spells. Each wizard can cast one spell each turn. The spell is normally cast on own turn, but the wizard can cast an instant spell on enemy's turn - if it does so, it cannot cast a spell in players's next turn. Instant spells can be cast anytime, even on enemy's turn! Any action currently being done is interrupted by the spell. However, if the dice is already rolled, its effect happens. Move spell is cast immediately after the wizard has moved. It cannot be cast if the wizard is in melee (exception: flight on himself). Shoot and melee is cast in appropriate phase, when the wizard is about to attack. Note that wizard in melee combat cannot cast a shoot spell. In addition, some spells are classified as temporal and after being cast, they last until start of the wizard's next turn. If the wizard is killed, however, the effect immediately ends. Note that cumulative temporal spells have no extra effect, except that they are harder to dispel (several dispels are needed). Thus, it is not harder to shoot while 2 storm spells are in effect but both need to be dispelled before the shooting can be done unhindered. This unit makes all own units carriers of powerful plague. All own units have special ability plague until start of wizard player's next turn unless effect is dispelled. Consult special attributes. This spell dispels any temporal magic spell (Contagion, Fear, Protection or Storm). If several temporal spells are in effect, this spell only dispels one of them. All own units are scary until start of the wizard player's next turn. Consult special attributes for effects of scary. Note that this spell does not make them brave. This spell can be targeted on any unit visible to wizard. The unit is counted as having special attribute teleport and brave until end of the movement phase and move of 4. However, the unit can only move to a square visible to the wizard when casting this spell. Note that the wizard can use this spell on himself, and as (exception to normal rules) can cast it to itself even when in melee. This spell can be cast at any time on unit within 2 squares of the wizard, even not in sight, which was just destroyed. On a d6 roll of 4+ the unit is healed and it can continue on fighting. If used in melee, the attacker cannot naturally advance to square of the healed target. This spell can be cast on the wizard itself if the wizard is destroyed. If target had plague and is saved, other combatants do not need to save against it. This spell creates force field around wizard and all 8 adjacent squares. All own units within that area gain +1 to their saves, become brave and are immune to plague as long as they remain in area (or arrive to it). Effects for multiple protections are not cumulative. This spell has range of 4 and can be targeted at any non-undead unit which just has been destroyed (it does not need to be visible). The target unit is immediately raised as new zombie unit and joins the Undead army, but cannot move or shoot until player's next turn. The raised unit is a normal zombie unit except if the destroyed unit has assault in which case undead cavalry is raised, or if the unit had bows (or longbows but not crossbows) an undead bowmen are raised, or if the unit had catapults, an undead catapults are raised. If Undead is already using maximum number of special Undead units, normal zombies are raised. Any heal spell is tried before this spell can be used. Regenerating unit cannot be raised. If own unit destroyed in melee is raised, any enemy unit in melee with old unit stay in melee with the new one. Wizard summons a powerful storm which hinders all ranged attack until start of wizard player's next turn. Any bow attacks, including crossbows but excluding rocks, are at -1 to-hit per each square of range instead of normal range modifiers. Catapults (including plaguebombs) are at extra scatter die for each 2 squares of range. Instead of attacking a melee target in the melee phase the wizard may cast this spell and force one opponent to make its save at -2 or it is destroyed. This spell can be cast by wizard exactly like ranged attack (so wizard may not be in melee). It has range of 4, it cannot be targeted indirectly and it strikes target automatically, which must make its save or it is destroyed. If targeted at melee, remember to roll which target is hit, after all. Appearance of this spell is always different: Human wizards prefer fireballs and lightning bolts, elves like thorn sprays while orc shamans cause a gigantic foot of their god to trample on enemy. Elven cavalry has been attacked by scary zombies. ChessWar can be expanded beyond normal chessboard and pieces. This section gives possible ideas on how to expand the game. Note that these ideas and rules have not been tested out. ChessWar can be played on any square-based game board, it needs not to be a standard 8x8 chess board. If using a larger game board, catapult (including Terrropult) range should be limited to 8 squares. The non-standard game board can also include terrain like forest or hills. Any extra terrain can be added as agreed by the players. Forest blocks visiblity like an unit but can be moved into. The unit in forest is visible normally but has +1 saves against ranged attacks and if charged, attacker loses any assault bonus. Hill blocks visiblity like units or forest. However, any unit on the hill can see over any units (but not forest or hills), and can likewise be seen. With Undead army, in addition to the above rules (well, first one really does not affect them) they also lose one undead unit of their choice at the start of their turn until has none left. When playing with custom gameboard, there could be enough room to handle multiple armies. In such a case, each army acts one by one as using normal rules. Total massacre rules should be used so that not any army just disappears. The game can also be played like 2 armies versus other two. In such a case, both armies of the same side should act at the same time. Total massacre rules should be used, but the side which first kills both generals of the other side is immediate winner. The game can be played with larger armies. Use whatever method agreed by the players, but remember that point costs are not comparable, even when the armies have same number of build points as generals are worth different points. Thus, the fairest way to extend armies is to double the points (and maximum number of units of each type) and give each player 2 generals. When an army has 2 (or more) generals, all of them must be defeated before the army is defeated. It is assumed that one of the generals is the supreme commander and the rest are second-in-command who take control if the first one is slain. Sorcerer (Q) 2 2 2 3+ -1 Spells: Contagion, Counterspell, Dispel, Fear, Storm, Zap! Plague: if destroyed in melee, opponents must make save at +1 or destroyed. Immune to plague. Note: Dwarves have no cavalry (knights). Wizard (Q) 2 4 3 3+ -1 Assault, Spells: Counterspell, Dispel, Fear, Heal, Protection, Zap! Wizard (Q) 2 3 2 3+ -1 Spells: Counterspell, Dispel, Heal, Protection, Storm, Zap! Shaman (Q) 2 3 2 3+ +0 Spells: Counterspell, Dispel, Flight, Protection, Strike, Zap! Regenerate: Returns to battle on a d6 roll 3+ at the end of the turn unless the square occupied. Cannot be raised. Flight (move): target visible unit has move 4, teleport and brave in movement phase, but can only move to a square visible to the wizard. Can be used to move wizard itself even when in melee combat. Seer (Q) 2 3 2 3+ -1 Spells: Contagion, Counterspell, Dispel, Protection, Storm, Zap! Note: Ratmen have no cavalry (knights). Plague: if destroyed in melee, others must make save at +1 or destroyed. Immune to plague. Roll a d6, adding attacker melee skill and substracting defender melee skill. If all opponents are destroyed, attacker can then make a follow-up move, as either advance to square just emptied (if diagonally, only if no enemies in side squares) or make a new charge move.